All poetry has an effect of incantation. This is why (like music, and unlike prose) the spell becomes stronger every time you repeat it. 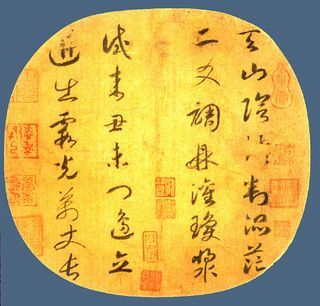 But it is an effect which seems to me to be particularly strong in classical Chinese poetry, perhaps because those syllables all have weight and length. It really does seem like you have to read them out all with equal power to make the magic work and open up the poem’s door. 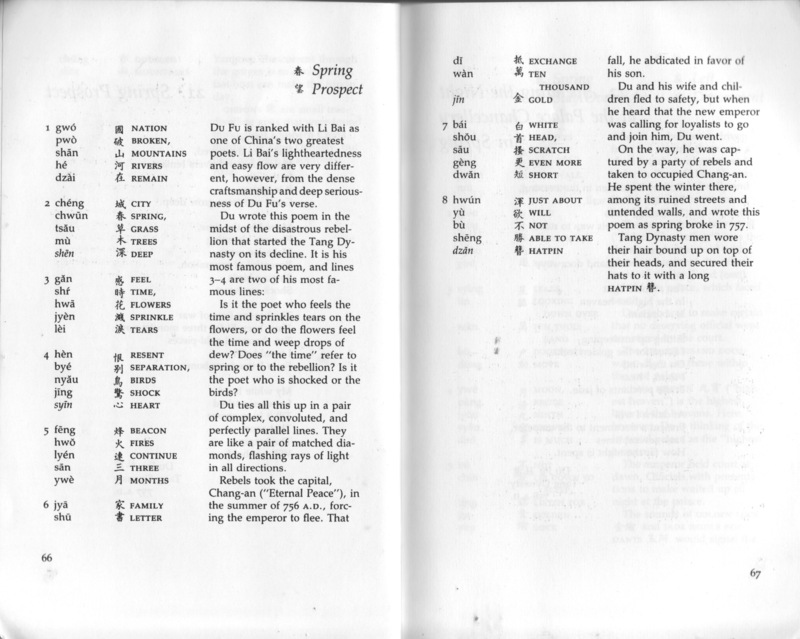 When you try and translate one of these poems into English you have to add in all the unstressed syllables and unweighted words which we use and the result is that you water the poem down to an unrecognisable degree. Try and drag out its meanings and it is like taking a watch to pieces. It doesn’t tick. Try and portray its shape and you end up with something like a stuffed bird. Something stiff which can no longer fly. 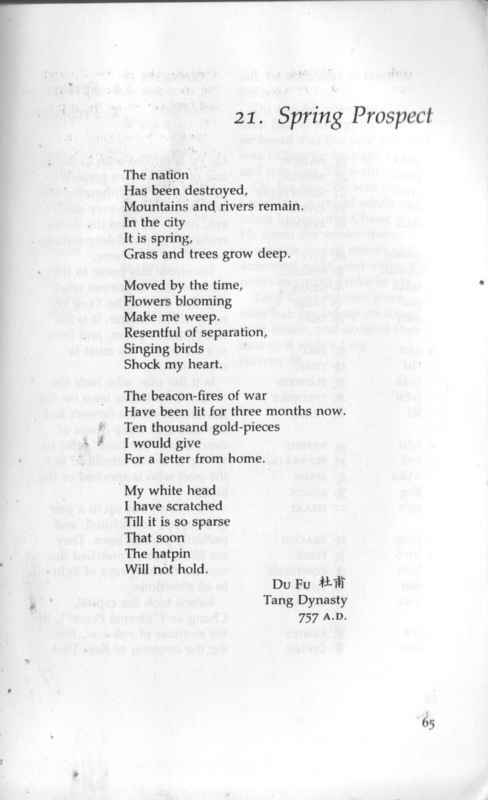 Most translations of Chinese poetry are like that. Another translator who has produced some beautiful modern English poems from the Chinese is David Hinton. Here is one based on a poem by Du Fu which I like a lot. These are both wonderful achievements but they still don’t show you the insides of a Chinese poem. I think that you can get an idea of that in a wonderful book I came across by chance in a bookshop in New York many years ago, thanks to the fact that I still haven’t learnt to tie up my shoe-laces properly. It was behind a door about six inches from the floor and if I hadn’t been looking for the most out-of-the-way place to get down on one knee and make a better knot I would probably never have read it. 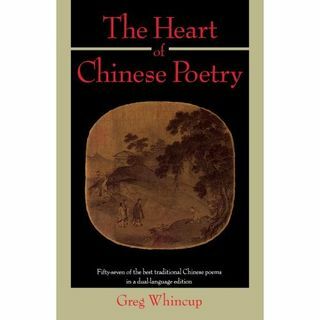 The book is “The Heart of Chinese Poetry” by Greg Whincup. Whincup uses the Yale system of transliteration, which may seem a little strange, now that Pinyin is so widely used, but it doesn’t take long to get used to it. 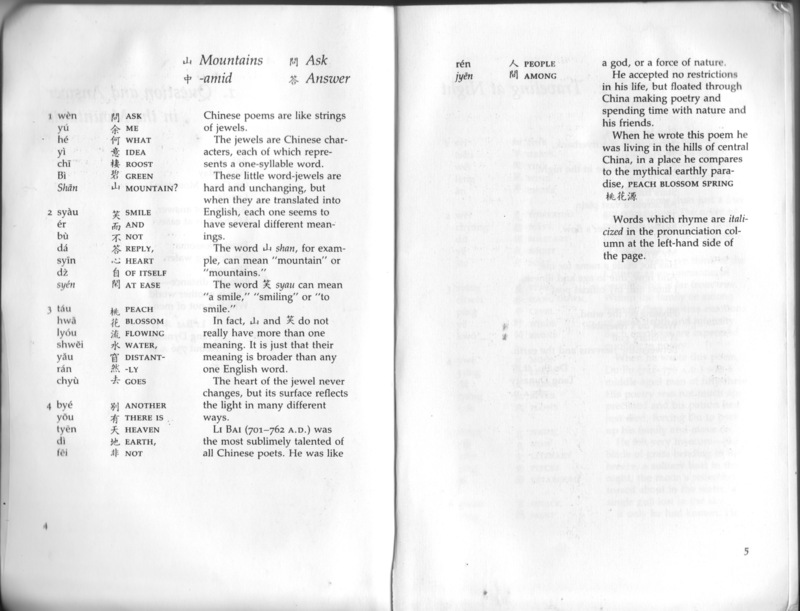 I know of some other excellent books which use a similar approach to explain Chinese poetry, for example Wai Lim Yip’s Chinese Poetry and François Cheng’s L’écriture poétique chinoise, but they can seem a little intimidating to people who know nothing about Chinese. 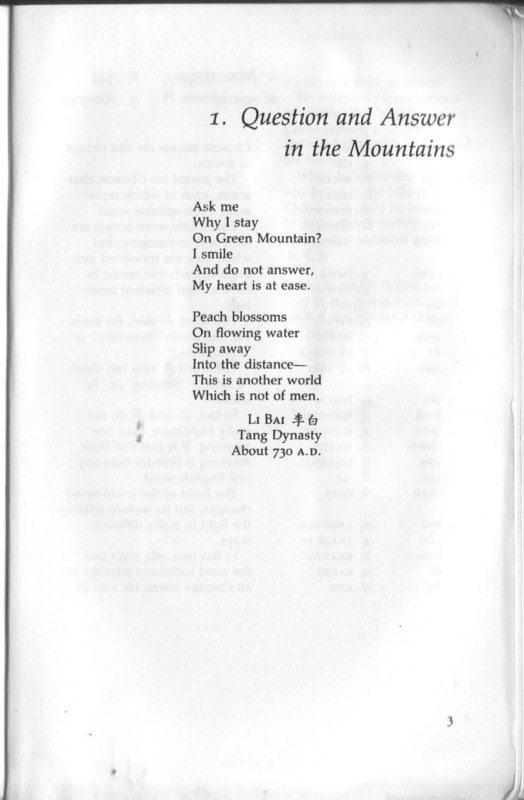 I always give people Whincup’s book as an introduction to Li Po, Du Fu, Meng Hao Ran, Wang Wei, Su Shi, Du Mu, Tao Qian, Jia Dao and all the other wonderful poets I would have liked to show examples of. Whincup’s book looks slim and looks simple. It seems to say “Let me show you this little garden” and then it leads you through a forest. Beautiful, Philip! Please do show the other examples.